Urban Roots' newly reopened Community Market, a cross between a farm stand, a retail store, and a community cooperative, provides healthy, local (when possible), whole foods to its Madison Square neighbors and the Grand Rapids community. Visit the Community Farm at our LAST event of 2018! The Community Farm Fall Volunteer Gathering will take place on November 7th from 3pm-6pm. Come visit the farm, get your hands dirty, and celebrate the season with our staff, volunteers, and community. Complementary doughnuts and hot apple cider! More information at here. Tucked between the houses and businesses of Madison Avenue in southeast Grand Rapids, an urban farm brings tall tomato trellises, creeping cucumber vines, an 800 square foot strawberry patch, and much more to the neighborhood. They make the most of the small space: this year over 4,000 pounds of produce will be grown on the small ¾ acre once-vacant lot. 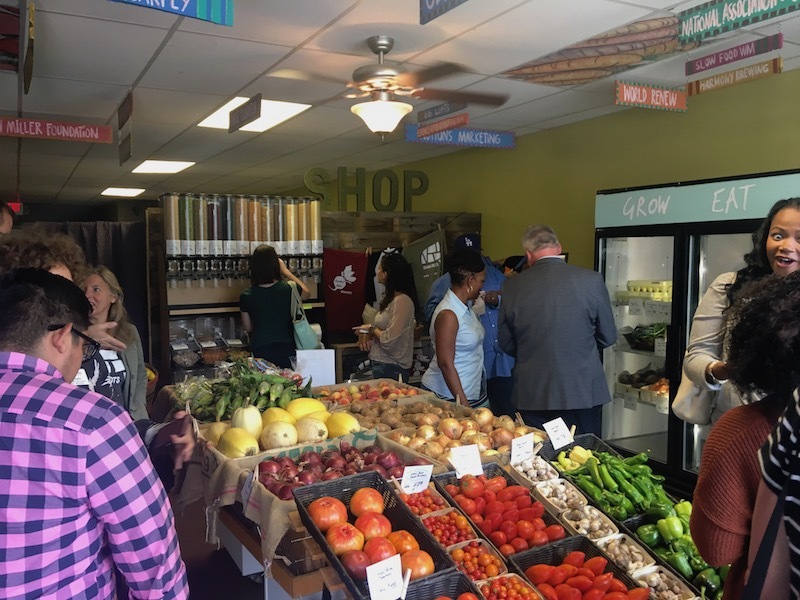 Thanks to gifts from Spectrum Health and the Amway Foundation, Urban Roots recently launched the Grand Reopening of its community market - a cross between a farm stand, a retail store, and a community cooperative. The goal of the Community Market is to provide healthy, local (when possible), whole foods to its Madison Square neighbors and the Grand Rapids Community. The Market is in its second year, however, because of increased funding, the market was able to significantly expand its offerings. This includes increased hours, offering additional produce from other local growers, staple pantry items like oils, nut butters and preserves, and bulk grains and beans. “We want high quality foods like ours to be accessible to all, and while our focus is on the immediate neighborhood, we also are excited to offer an opportunity for a non-traditional market to all of Grand Rapids,” Baker said. They accept EBT/SNAP cards, WIC and SMF coupons, Double Up Food Bucks, cash, and credit cards. In addition, the items are priced according to a sliding scale model. Specifically, Madison neighbors living roughly within the boundaries of Division and Kalamazoo, Burton and Franklin, pay a lower price. Urban Roots was founded in 2013, and became a federal 501(c)3 in 2015. They have been growing on the current lot on Madison Avenue, just south of Hall Street, since 2016. Their mission of “cultivating healthy communities” is achieved through educational programming for schools and other organizations, free or donation-based workshops, community events, and volunteer opportunities. The Market will be an important anchor to the existing programs Urban Roots offers. Volunteers and school groups that spend time working on the farm will literally be able to see the fruits of their labor, on the shelves of the market for sale to the community. Urban Roots will also be providing cooking workshops using only ingredients that are available at the market, so attendees know exactly where they can purchase the items at an affordable cost. In addition, the Market will provide a platform for customers who are seeking other ways to get involved with the organization. The Market has already been a success since its opening on September 6th, seeing over 150 unique customers. “I had a customer the other day that went to the corner store down the street in search of cucumbers. They weren’t selling any, and while he was biking home, he noticed the farm and market. He went home with two cucumbers grown on our farm,” Baker said. She hopes that, with mostly corner and liquor stores in the area for grocery shopping, the Urban Roots Community Market will become a go-to for neighbors in search of fresh food for their families and households as well as area residents in search of local farm produce, bulk goods, and other healthy staples without leaving Southeast Grand Rapids. The Market is currently open Tuesday, Wednesday, and Thursday from 10am-5pm. They are planning to stay open year round, with hours increasing in the Spring. Learn more at urbanrootsgr.org/community-market.